At the £2.6 billion Beatrice offshore windfarm project located 13 km off the Caithness Coast of northeast Scotland, construction is continuing at a good pace. The project, located in the Outer Moray Firth off northeast Scotland, is led by energy giant SSE and at 55 metre sea depths is at one of the deepest wind farm depths in the world. It will be capable of generating enough electricity to reduce annual CO2 emissions by 850 000 tonnes. The Beatrice array includes 84 Siemens 7 MW wind turbines to generate 588 MW of electricity. Each turbine is constructed with a 154 metre diameter rotor and has a total turbine height of 198 metres. Construction crews in this region of the North Sea will be working at these sea depths of 55 m to anchor each turbine to the seabed. Serving as the underwater foundation platform, jacket substructures are being constructed by Burntisland Fabrications (BiFab) at lengths of 68 to 81 metres. The first 26 jacket substructures are currently under construction at BiFab’s facility in Methil, Fife. With each turbine anchor weighing approximately 1000 tonnes, a heavy lifting partner to devise an efficient, repeatable and safe plan for transporting the offshore jackets from the fabrication facility was needed. Each structure would have to be lifted into a vertical position before loading of the turbine bases onto the special transport vessels for final positioning. BiFab selected Sarens, of Wolvertem, in Belgium. “Our strategy included using self-propelled modular transporters (SPMTs) to move the jacket in a horizontal position approximately 80 metres to the up-ending location at the harbour,” says Andrew Hunt, operations manager for Sarens. 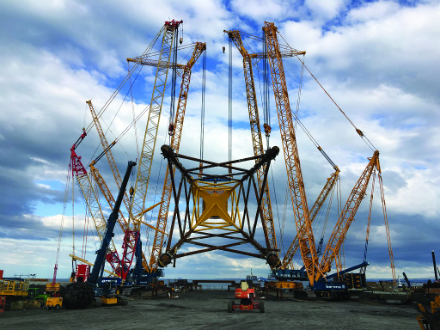 For the delicate task of lifting the jacket substructures into their vertical position, given the unpredictable weather at BIFAB’s Methil facility, Sarens relied on four large cranes. “We used our Demag CC 9800 and CC 8800-1 crawler cranes [heavyweight 1600 tonne capacity units, each carrying 640 tonnes of counterweight] to carry the main load and two smaller cranes, one of them a Demag CC 2800-1 crane, to help finesse the jacket into its vertical position” said Hunt. Meanwhile staff at BiFab have agreed to continue working on their current orders, which are said to be 77% complete, even though they might not be paid. Workers’ representatives said that staff had agreed to a ‘work-in’ to ensure that the contract they are fulfilling remained at their yards. The company has yards in Burntisland, Methill and at Arnish on the island of Lewis. Its workforce includes 251 permanent staff and 1132 agency workers.